Soft skills are qualities that reflect what kind of employee you will be. In reviewing job posts, I found that employers are looking for employees who are self-motivated. Here are a few suggestions of ways to present yourself on resumes and in interviews as an employee who doesn't need to be told what to do. 1. Tell a story that begins with these words: "I took the initiative to. . ." or "I volunteered to. . ."
2. Talk about a time you saw a problem and fixed it. 3. Use the word the employer is looking for: "Demonstrated leadership and self-motivation by . . ."
Every boss dreams about having employees who know who to do the job and care about what they do. If you can communicate that you are this type of person (and you have the right kind of experience and hard skills), you will get the employer's attention and be well on the way to a job offer. I was on a tight deadline for three projects yesterday. A client called to cancel an hour long session. At first, I said this was great because it gave me more time to work. Then I looked out the window and saw a sunny beautiful day. I put on my coat and took a walk for about half an hour. Could I have spent that time working? Sure. But I also know that in a month it will be a lot colder. In two months, I will probably be shoveling snow. What’s my point? Take some time to do what makes you happy. Even with my break, I met all of my deadlines and still got to spend some time enjoying the sun. Plan your time well, and find a way to do something that makes you happy. Life’s too short to let it be all work and worry. I'm spending a few days in Philadelphia, the city that gave us one of America's working heroes, Benjamin Franklin. 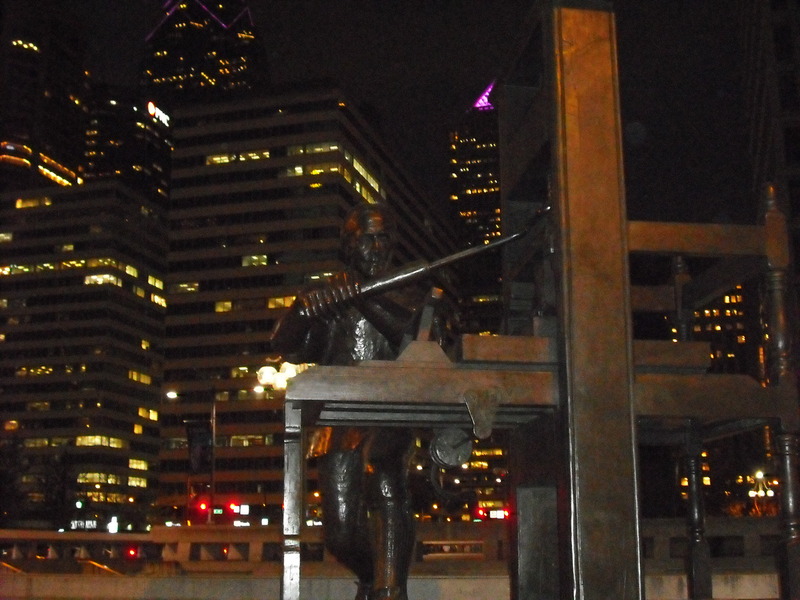 As a teen, Franklin was apprenticed to his brother and learned the craft of printing. He later published his own writing and became famous for it. He also won fame as a politician and scientist. He valued work and never lost his sense of curiosity. For me, he is the most amazing citizen our country has ever produced. 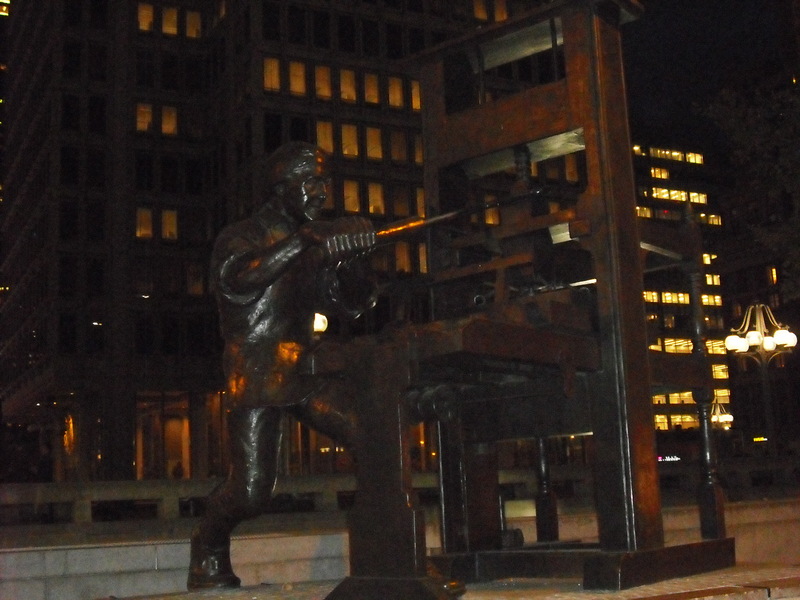 Earlier tonight I saw a cool sculpture of Franklin at his printing press. Here are two photos. Click on the image to enlarge the photo. I recently read an op-ed claiming that millennials are terrible workers: They don’t know how to communicate. They only want to work forty hours a week. They feel entitled. Remember stories about slackers? Before that it was hippies. Beatniks. In each case, young people were smeared as lazy and unmanageable. The problem with this prejudice, like all other forms of prejudice, is that it demeans an entire group, and it is a simplification. I share some concern about the impact of texting on how we communicate. However, I know many people in their forties and fifties who hide behind texting when they should be making a call or holding a face-to-face meeting. What’s wrong with millennials? The same thing that was wrong with slackers, hippies, and beatniks: They don’t control the mainstream media, and they aren’t making hiring decisions. What I have seen in millennials is a type of realism about what work should be. One of my millennial clients took a big pay cut to have a better quality of life. I challenged her to think about how long it will take to make up the lost income and related raises. Without skipping a beat, she asked me what good the money will be if she is always miserable. She thought through what she was giving up and what she was gaining. I would call that good career management. Are some millennials lazy? Of course. There were lazy Baby Boomers and probably even some lazy folks in the Greatest Generation. My impression is that millennials want to work in jobs that interest them and treat them fairly. They have learned from watching their parents and older brothers and sisters work hard with little reward. They understand the game. What if a young person doesn’t work between the ages of 16-24? AP reports that 15% of Americans in this age group are unemployed and have little prospect of finding work anytime soon. The report notes that people who don’t work during this period fail to learn skills that they will need later in life. I would take this problem to a more basic level: These young people will not have the opportunity to learn how to work. While I preach the importance of skills, there are more fundamental elements involved in working: getting up in the morning, getting to work on time, listening to the boss, and putting out a good effort. We learn our work ethic early, and too many young Americans are not having the opportunity to learn how to work. What should be done? The best answer is that we need more good jobs for adults, so young people can work lower level jobs while they are in school. While some manufacturing is coming back to the U.S., it’s too little, too slow. The next best alternative would be some kind of government sponsored program, which were common just a few years ago. Again, this solution seems impossible in a political era that is captivated by the idea of cutting spending rather than growing an economy by investing in the country and its people. What is the solution? I don’t know. It almost feels like our leaders want young people to fail. They care more about what is owed to banks and investors today than what we out to the generations that will be leaders tomorrow. To me, that is the true definition of bankruptcy – moral bankruptcy.